SpaceX on Wednesday deployed a broadband communications satellite for IntelSat, after twice ditching launch plans in the final seconds before liftoff earlier this week. The satellite, known as IntelSat 35e, soared into the blue sky over Cape Canaveral at 7:38 pm (2338 GMT), riding a Falcon 9 rocket to a distant, geostationary orbit. The force required to send the payload to space meant SpaceX decided not to attempt to return the first stage of its Falcon 9 rocket for an upright landing. The California-based company now regularly lands the tall portion of the rocket back on Earth following launches, as part of its effort to make rocket parts reusable, like airplanes. The launch finally went ahead after two delays earlier this week, both in the last 10 seconds before liftoff. A SpaceX commentator said on the company's launch webcast that Monday's delay came about when a measurement in the rocket's first stage avionics system did not meet a preprogrammed software limit, but the rocket was in good shape. 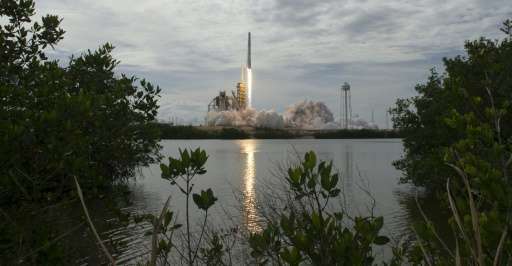 Nor was the delay on Sunday due to any flaws with the rocket, SpaceX said. Engineers also spent the US Fourth of July holiday reviewing the rocket for safety issues. "SpaceX team reviewed all systems again late last night," SpaceX chief executive Elon Musk said on Twitter ahead of the launch. "Done our best to ensure all is good." The satellite is the fourth of Intelsat's EpicNG next-generation high throughput satellites, and aims to improve wireless connectivity for the Caribbean, Europe and Africa.